Registration only takes a few minutes and the benefits are numerous. It is completely free for applicants to use our services. We offer you the most convenient and efficient way to expose your talents to a wide variety of quality companies - those seeking your military experience. Begin your exploration now and find the perfect career using our exclusive tools and resources. MilitaryJobZone exposes you to employers that understand the value military experienced candidates can bring to their organization. Regardless of rank, military members entering the civilian workforce have leadership experience, a relentless work ethic, excellent communication skills, and a focus on mission accomplishment. WASHINGTON, March 2006 – Sexual assault is one of the most underreported crimes in the military and in society as a whole, a top defense personnel and readiness official said. "Some studies indicate that only 5 percent of sexual assaults are reported," Air Force Brig. Gen. K.C. McClain, who heads DoD's Joint Task Force for Sexual Assault Prevention and Response, said during the DoD Women's History Month observance at the women's memorial here March 21. "The highest number we've ever seen is about 35 percent. We don't know where DoD fits in that range, but we're in there somewhere." McClain is the single point of accountability for DoD sexual assault policy matters. The task force, stood up in October 2004, develops policy and programs to improve prevention efforts, enhance victim support, and increase offender accountability. A DoD directive on the issue was published a year later. A DoD instruction that expands on the directive is expected to be published shortly. One task force goal was to remove barriers that prevent victims from reporting sexual assault, McClain said. "Immediately following a sexual assault, there is an overwhelming sense of loss of control and a sense of powerlessness," she noted. "For many, the thought of participating in the investigative process is so overwhelming that they chose to get no care rather than to go through that investigative process." McClain said sexual assault turns the victim's world upside down, and the trauma of being assaulted is a shock from which many victims never fully recover. "And the thought that you're going to have to talk your commander, supervisor, the investigators -- all these people are going to know," she noted. "That's overwhelming for some people, and they don't want to deal with it." She said some barriers that prevent victims from reporting sexual assault include embarrassment, shame, and not wanting anyone to know what happened to them. Sometimes not understanding the process or misconceptions of what's going to happen prevent individuals from coming forward. To help overcome these barriers to reporting, DoD in 2005 introduced a "restrictive reporting" option to victims of sexual assault. Victims can come forward and seek counseling and other treatment, but can choose to not have a criminal investigation into the assault opened. The general said sometimes victims' initial reaction is: "Stop! Leave me alone! I don't want to see anybody! I don't want to do anything!" However, after having time to gather their strength and resources, many victims think about what happened to them and decide to participate in an investigation, McClain said. A 2005 report to Congress stated that the number of reported sexual assaults in the military increased by almost 40 percent between 2004 and 2005, McClain said. The 1,700 cases reported in 2004 climbed to 2,374 in 2005, an increase of 674 cases. "Of those 2,374 reports, 435 were restrictive reporting," McClain noted. "So in a six-month period, in a brand new program that was still be implemented, we still had 435 people who were willing to come forward. Of those who chose restrictive reports initially, a quarter later changed their minds and allowed investigations to proceed. "Although we hate that we have any sexual assaults, we do think that these numbers indicate that our programs are working," McClain said. "We're still in the implementation stage, so we're not claiming victory, because we know we still have a long ways to go." Sexual assault prevention training begins in initial training and continues throughout members' careers. It's also incorporated into commanders' training. "Commanders are the key to sexual assault prevention and response," McClain said. Individuals preparing to deploy also receive refresher training on what constitutes sexual assault, how to prevent it, and how to report it while deployed. McClain noted that the incidence rate of sexual assault in Iraq and Afghanistan is lower than it is across the rest of DoD. "We don't know for a fact what to attribute that to, but my supposition would be that in the area of operation you're focused on the mission -- quite frankly, staying alive," she said. "You're in a tighter group, a tighter environment with a sense of you're all in this together. We're all family, and we're all working toward the same mission." McClain noted that the DoD theme for Sexual Assault Awareness Month, which is April, is "Sexual Assault Prevention Begins with You." She emphasized that sexual assault will not be tolerated in DoD. "Everyone from our most junior member to our most senior member has a role in prevention and response," she said. "It's not a commander's program; it's everyone's responsibility." WASHINGTON, Nov. 2005 – Pentagon officials want to emphasize to civilian employees that the changes in their personnel system are all about improving national security. After a two-year process, officials have designed the new National Security Personnel System to be faster, more flexible and more agile, said Michael Dominguez, assistant secretary of the Air Force and head of the NSPS product team. "This whole personnel system has been designed to focus on national security and support to national security," he said. "It's important, because the nature of the threat is changing." The system is performance-based and civilian employees can "take ownership of their performance and their success" in the national security mission, said Mary Lacey, the program executive officer for the system. The regulations governing the system go into effect beginning Dec. 1. However, a number of federal employees unions have vowed to stop implementation. "We collaborated with the representatives of the unions in the design of NSPS," said Dominguez. "We received their inputs during the comment period and modified the regulations around them. It's unfortunate that everyone won't be happy with these regulations, but I think we've tried to strike the best balance that's possible." The system requires DoD to continue collaborating with the unions as implementation progresses. "Their feedback to us is essential," he said. Lacey said the labor relations portion of the regulations become effective Dec. 1. The human resources portion of the system - the staffing, the classification, the performance management pieces - will phase in over a number of months in the January to March timeframe, she said. Characteristics of the new system are new position descriptions, broader pay bands, faster hiring and better federal sector competitiveness with private firms, Lacey said. The first 60,000 people will transition into the system early next year. "They will be given new performance standards," Lacey said. "It's very important that we not make any performance-based pay adjustments until they have had the opportunity to perform under those standards and performance factors. "It won't be until January 2007 that their pay will be adjusted based on performance," she emphasized. When people transfer into the system, they will have "run time" in the current grade step, Lacey said. As part of that transition, DoD will "buy out" the remaining time for a within-grade increase. "So you'll find that the vast majority of our employees upon initial transition to NSPS will get a pay raise," she said. Dominguez said he has a lot of confidence that the department can handle an effort that will transfer 650,000 civilian employees in 41 civilian personnel systems into a performance-based pay system. He said the department has had a number of performance-based demonstration projects - the most famous being China Lake, Calif., begun in 1979. Roughly 45,000 DoD employees already are covered under some sort of performance-based pay system. "In the Department of Defense we have extensive experience in managing these transitions to performance-based pay and in running performance-based pay systems," he said. "We have very, very high confidence that we have got this pretty nearly right and that high-quality leaders and employees out there will make this work." 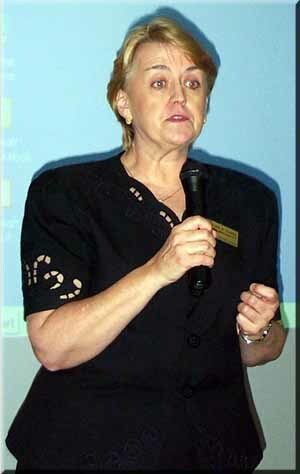 MONTGOMERY, Ala., Feb. 2005 – Human resources specialist Linda K. Stouffer said when she visits college campuses, she tells students the Defense Department is "the 'employer of choice,' and our job is to support America's defense around the world." (Click photo for screen-resolution image); high-resolution image available. Stouffer, who works for the DoD Civilian Personnel Management Service's Defense Applicant Assistance Office, said DoD has jobs "from A to Z." "When you see a DoD sign at a job fair, that doesn't mean you have to wear a uniform and join the military," Stouffer told a large gathering of university presidents, administrators and students here at the DoD technical assistance workshop at Alabama State University here Feb. 23. "DoD has more than 700,000 civilian jobs around the globe. "We try to encourage students to work for DoD as civilian employees and to understand that if they want to join the military, supporting our nation's defense in uniform is the most awesome job they could ever have," she continued. "But they could also support our nation's defense around the globe in a civilian capacity." The Defense Applicant Assistance Office came into being in 2003 to be a resource for anyone who wanted to get more information about civilian jobs in DoD, Stouffer said. "We have advisers available to help people in their job search process -- to talk to them and explain information on various job announcements," she noted. "We also connect them with other recruiters in DoD." Stouffer said her office looks for events to spread the word about its existence, particularly minority events such as the DoD's African-American History Month Outreach events at Alabama State University. She said her office comes under the deputy assistant secretary of defense for civilian personnel policy. "This office wanted people on staff who could answer questions for students and anyone wanting information about DoD jobs," Stouffer noted. "That way, they could pick up a phone and have a live person to talk to. … Or they could send us an e-mail and they will get an immediate response." Stouffer said advisers will discuss job search process; provide information about DoD vacancies, occupations and missions; assist with questions, applications, forms and status of applications; explain DoD job terminology; and provide a connection between job seekers and recruiters. She said it's helpful for students to know what states have the highest concentration of federal civilians who work within DoD. "Our Top 10 states are Virginia, California, Texas, Maryland, Georgia, Florida, Pennsylvania, Washington, Ohio and Oklahoma," Stouffer said. "So the message to students is, the more mobile you are and the more willing you are to relocate to where that job is, the better opportunity you will have." DoD has 6,000 offices and installations in every state around the country and in 146 countries around the world. DoD's three military departments and 16 defense agencies recruit on many college and university campuses. The Defense Applicant Assistance Office is the central point for marketing DoD-wide civilian employment opportunities, she noted. "Out of about 800 occupations within the federal government, you'll find jobs in DoD in about 700 of those occupations," she noted. The most critical skill needs for DoD in the next two years are engineers, administration/program management, education, security and protection, accounting and budget, information technology and physical sciences, according to a Partnership for Public Service study. DoD components also offer many intern, co-op and entry-level professional development career programs, as well as support for graduate fellowships and scholarships in career fields where there is high demand for well-qualified candidates, according to Stouffer. She pointed out that the internship program doesn't always mean just a summer job. "These are entry-level full-time professional jobs," she noted. Job seekers can visit the office's Web site, or call (888) DoD-4USA (363-4872) toll free. The TTY number is (703) 696-5436. You don't need to worry about employment once you use the Blackjack Glossary and Blackjack History at CasinoBonus.org to start winning blackjack whenever you play! WASHINGTON, Feb. 2005 – DoD and the Office of Personnel Management will publish the regulations that will govern how the new National Security Personnel System will operate, DoD officials announced Feb. 10. The proposed regulations will appear in the Federal Register Feb. 14, and officials invite comment. Navy Secretary Gordon England said once the public comment period ends March 16, officials at DoD and OPM will confer with the various federal employee unions and then give all comments "fair and full consideration." "Our plan, then, is to begin the implementation this summer," England said. "We'll learn through doing. We'll do this in phases. And we will progressively add more and more employees (and) learn as we go until completion at the end of 2008." The publication marks the end of the first phase of implementing the personnel system. The system, enacted by Congress in 2003, will allow DoD to better manage civilian personnel. Once in place, the department will be able to shift personnel among jobs, hire faster and reward good workers. "Now NSPS is going to replace a 50-year-old system," England said. "We're going to replace (the current system) with a very modern system that we need to attract, recruit, retain, compensate fairly and manage our employees." The system will focus on performance, flexibility and accountability, the secretary said. "It will be much more responsive to the national security environment, and … it will fully preserve our employee protections, our veterans preference and employee benefits." If all goes well, the first 60,000 people under the NSPS will transfer to the system in July. They will transfer at their current salaries. General-schedule workers will stop being GS-designated employees and will transfer to pay bands. It will be a year before the first decisions are made on performance pay raises, officials said. Dan Blair, the OPM's acting director, said the new rules will not change merit system protections, whistle-blower protections, veterans preference, benefits, rules against prohibited practices or leave and work schedules. NSPS will change the general schedule system and job classification standards. It will give managers more flexibility in reassigning employees to fulfill critical needs and more flexibility in where employees will work. "We have encouraged our unions to work constructively with us, and also with the federal mediation and conciliations services so we can find common ground and make this an even better system," England said. However, five federal employees unions announced they will challenge the system in court. The unions contend DoD and OPM have not adequately consulted with the unions. Blair said that with NSPS the entire federal government personnel system has "reached a tipping point." DoD, the Department of Homeland Security and a number of other federal agencies will be covered under new, more responsive personnel rules. "More federal workers will be covered by reformed and modernized systems than the current general schedule," he said. "These changes haven't come easily. But this new system, coupled with the DHS system, show that transformation can take place in an environment which honors merit and ensures collaboration and cooperation." FORT LEE, Va. –The commissary has been more than a great place to shop and save money for Andrea Chisholm, who has worked at three different commissaries in the past eight years as she and her family moved about the world to fulfill the demands of military life. Chisholm, a meat department worker at the MacDill Air Force Base, Fla., commissary, is one of more than 3,200 military spouses who perform a variety of jobs in commissaries and other DeCA activities around the world. WASHINGTON, June 2004 — A federally funded program, Helmets to Hardhats, is making good on the military recruiters "selling" point that service members gain valuable skills they can apply in the private sector following their service. The program helps service members and military veterans put their training to use as they transition to jobs in the building and construction trades. Launched in January 2003 with funding from the 2003 Defense Appropriations Act, Helmets to Hardhats provides an important link between veterans and soon-to-be veterans and 15 building and construction trades organizations clambering for their skills. Collectively, these organizations represent about 82,000 contractors nationwide. employment page. Companies can expect to see 500-1,000+ job seekers at each event. Because it's confidential, easy and FREE!!! RecruitMilitary.com is a job site that targets veterans and service members making the transition from the military to the civilian workforce. Providing Transition Assistance to military members worldwide. Find out about different occupations and industry outlooks provided by the Bureau of Labor Statistics. 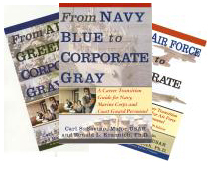 Birkman Method Career Style helps guide you to careers that meet your profile. Brings job search articles and information about employment opportunities. One of the largest job banks around. Public employment services in each state. Major newspapers partner to bring top job listings in one place. Source for jobs at major US companies, and state and federal government agencies. Receive daily emails of job summaries that match what you are looking for, from part-time to full-time in a range of careers.